typically one of your greatest assets. may help provide for you and your family during your time of recovery. If you are involved in an accident and have disability income insurance, a portion of your income may be paid to you during the time you are recovering from the accident and unable to work. In the event of an illness, such as cancer, a heart attack, disability income insurance can help you through the tough time. Your health: Do you have pre-existing conditions? Are you overweight? Do you smoke? Your age: The younger you are, the more likely you are to be covered. This is because the younger you are, the less health issues you will typically have. Your income: The amount of disability insurance coverage that you can purchase is based on your income. As your income increases, you may be able to purchase additional coverage. Given these three factors, typically a good time to buy disability income insurance is when you are young. When you first start practicing, your age works in your favor. That said, even if you are not just starting out, the sooner your purchase disability income insurance, the better. 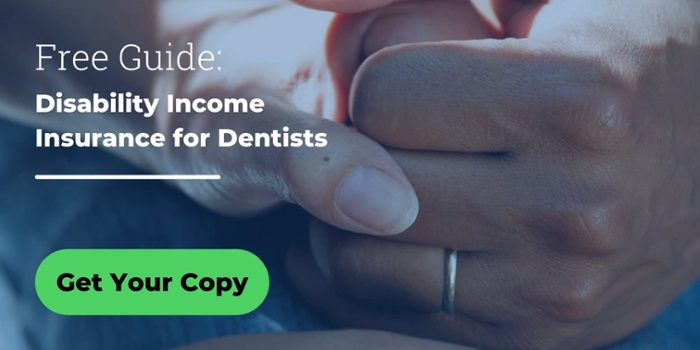 When you graduate from dental school, you could join a practice, where there might be a group policy for disability income insurance available to you. These policies might be appealing, but it may be a good idea to supplement them with an individual policy. Remember, it’s unlikely that you’ll get a better rate on an individual policy than when you’re young and healthy. The individual policy you purchase can be tailored to suit your specific needs. You may add enhancements to your disability insurance policy to make your policy more comprehensive. These enhancements are known as riders, they can help you add to the benefits for the premiums you pay. Typically, as you progress in your profession, your income tends to grow. Additionally, the cost of living may rise. With this in mind, you could choose to potentially increase your coverage over the course of time. In most cases, once you have obtained coverage, it typically continues to age 65 as long as you pay the premiums. If you do not pay the premiums your coverage can be cancelled. If you should change jobs or open up your own practice, your individual disability income Insurance can move with you. Before the insurance company determines your premium, you must decide whether you would like a level or graded premium. Level Premium - Level premiums remain constant based on the age you purchase the coverage. The younger you purchase your disability income coverage, the lower the level premium. Premiums remain level until you reach age 65. Of course as you increase your coverage in the future as your income grows, added to the original level premium will be the cost for the new coverage. Graded Premium - This type of premium may start out lower and rises each year. This strategy is often used when obtaining coverage while a dental student or resident. A graded premium may save you a significant amount of money as you are starting your dental career, and can be changed to level once you are earning money and in a position to pay the level premium. There are many different factors the insurance company takes into account as they determine your premium. Educating yourself about the categories into which you fall might better prepare you for the amount your premium for disability income insurance could be. Generally, the more income you earn, the more coverage you can purchase. As you grow in your profession over time, you’ll likely want more coverage. In most cases, the waiting period for your coverage to start is 90 days from when your injury or illness occurred. Shorter waiting periods, typically mean higher premiums. The maximum duration for payment of disability insurance benefits is referred to as the “benefit period.” Typical benefit periods include to age 65, to age 67, and to age 70. The longer the maximum benefit period, the higher the cost. Each additional rider you add to your policy, such as “own-occupation,” is typically an additional cost. “Own-occupation” means that the insurance company pays the benefit if you are unable to do the material duties of your occupation. If you choose to do another occupation the benefit is not reduced due to the new income. In the coming chapters, we will discuss riders to your policy in greater depth. Riders refer to an enhancement to your disability income insurance policy. There is an additional cost associated with adding riders to your policy and these features may be worth the additional piece of mind. 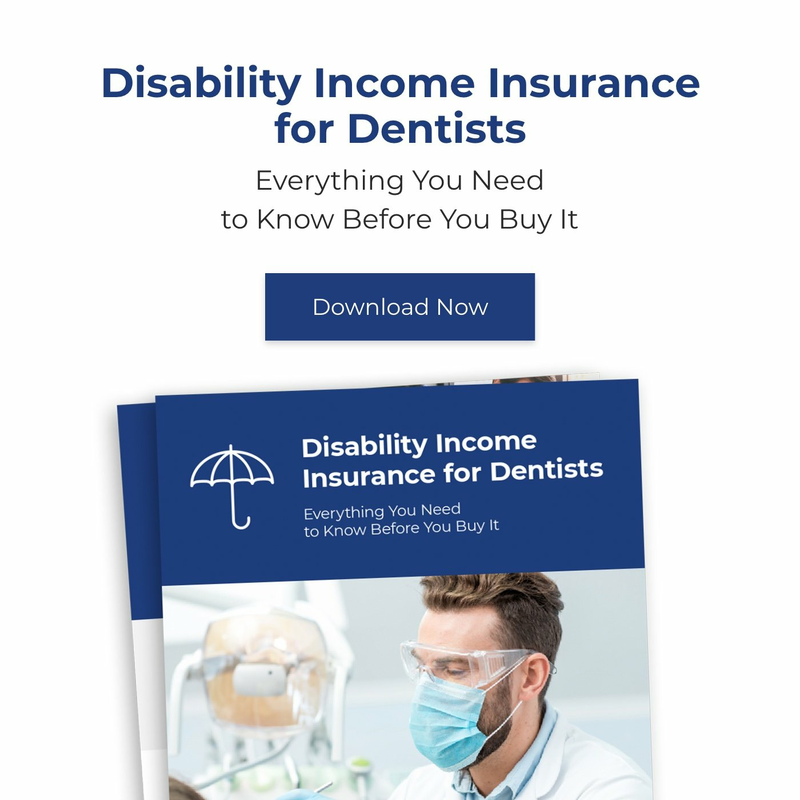 The own occupation rider is generally one of the most important provisions a dentist can have in his or her disability income insurance policy. If you are unable to do the material and substantial duties of your occupation due to a disability, you can still receive your full disability benefit. With this rider, benefits will not be reduced if you return to work in a new occupation. For example, if you suffer an injury in a car accident which leaves you unable to practice dentistry, but you return to work in a new occupation, the insurance company will not reduce your disability insurance benefits. The partial, or residual disability benefit rider, is a potentially important option that can be part of your disability policy. A partial, or residual disability, is a disability in which you are still able to practice, but suffer an income loss due to the disability. For example, if you suffer from a back problem and are still able to practice on a limited basis, you will likely experience an income loss. Due to this income loss, you may be eligible for partial or residual disability benefits. Another such example would be an individual diagnosed with cancer and cutting back workload to part time while going through treatments. Companies typically require a minimum threshold of income loss to qualify for partial or residual disability benefits. This threshold is usually a 15%-20% loss. In addition, if you are partially or residually disabled and suffering an income loss of 75% or greater, many companies will pay 100% of your monthly benefit. Many claims scenarios include periods of both total and partial or residual disability. For example, if you are in an automobile accident and unable to practice for six months, upon return to your practice, it is likely that you will, at least initially, return on a limited basis and suffer an income loss. In the case of a degenerative type disability or a progressive sickness, the disability may start as a partial or residual disability and ultimately evolve to a total disability. A partial or residual disability rider may be beneficial in helping to replace lost income in any of the above situations. It is important to secure your initial disability policy at a young age when you are more likely to be in good health. The Future Insurability Rider may be a wise addition to your policy. The Future Insurability Rider allows you to purchase additional coverage in the future, as your income increases, without having to typically prove good health. Coverage must be offered at regular rates and without any exclusions irrespective of any changes in your health. You are probably aware that inflation typically reduces the value of a dollar over time. In the event of a long-term disability, it is important that your policy contain a cost-of-living adjustment rider. This rider provides for annual, post disability adjustments to your monthly benefit to help prevent an erosion of your purchasing power. As you age, your benefits typically increase based on the amount of inflation adjusted for by this rider which may vary depending on the policy. For example, assuming inflation of 3%, in 20 years you would need over $18,000 to buy what $10,000 buys today. In addition to the disability income benefits that can be paid to you if you become too ill or injured to work, this rider can help ensure you don’t fall behind on your student loans. This could help to protect your credit, should you be unable to work. Falling behind on student loan payments can be expensive due to interest and penalties. This rider is typically a potentially useful option for dentists just starting out. Student loan riders typically reimburse all or a portion of your student loan payments to prevent you from falling behind and affecting your credit score. This rider provides for disability benefits over and above your regular monthly benefit for total disability in the event that you are severely disabled. A severe disability will certainly impact your ability to work but may also impact your independence. The additional monthly income paid by the catastrophic disability rider can help offset increased costs associated with a severe disability i.e. paying a caregiver. Chapter 5: How Do You Get Disability Income Insurance? To initiate the underwriting process, your Treloar and Heisel insurance agent will complete a disability income insurance application. Upon completion of the application, if a medical exam is required, a nurse will contact you to schedule an appointment. The exam is scheduled at your convenience and the insurance company’s expense and often includes blood and urine tests. In addition, the examiner may ask you questions pertaining to your health history. The insurance company underwriter will examine your application, medical exam results and may request medical records from your physician. In addition, the underwriter will also review your tax returns in order to determine the amount of coverage you qualify for based on your income. It is important to note that companies oftentimes have special limits for students/residents/new practitioners. If applying within these guidelines, tax returns will not be required. Once the underwriting process is complete, your Treloar and Heisel insurance agent will contact you in order to review the insurance company’s offer and confirm your understanding and configuration of the policy. If you like the terms of the policy, your agent from Treloar & Heisel can help guide you through the final stages of completing and signing your policy. Your future and your family should be covered with disability income insurance in the event you are temporarily unable to work. Treloar & Heisel has years of experience selling insurance to dentists at every stage in their careers. We work hard to get you the coverage you need at the price you want. Call us today to set up your complimentary consultation to discuss your disability income insurance. * These definitions are provided for general informational purposes only and are not binding. For the actual contract definition, please refer to your policy. ** This list does not include all the potential, beneficial riders. Other riders may also be available. You should ask your agent to review all possible riders before making a decision. Treloar & Heisel and Treloar & Heisel Risk Management which are divisions of Treloar & Heisel, Inc. Insurance products offered through Treloar & Heisel and Treloar & Heisel Risk Management. Treloar & Heisel, Inc. and its divisions do not offer tax or legal advice. For legal questions and advice related to the specifics of the above strategies, you should consult a licensed attorney in your state. Treloar & Heisel, Inc. and its divisions do not offer marketing advice. The information provided in this material is for informational purposes only. This material is general in nature and not offered as advice on a particular matter and should not be relied on as marketing advice.